Fermanagh and Omagh District Council were our hosts for the day when we went to Enniskillen in May. 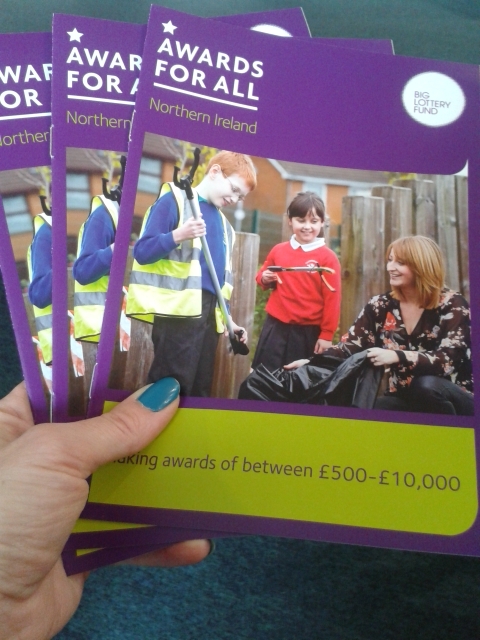 They arranged funding surgeries for us, mainly focused on our small grants programme Awards for All. This was a fantastic opportunity to have face to face conversations with our customers and to give advice to local groups on funding. Fermanagh looked beautiful in the sunshine, however there wasn’t any time to relax as there was a full schedule with sessions from noon to 8pm. Staff from our Outreach and Awards for All teams spoke to a variety of groups: from playgroups, sports clubs, arts clubs, environmental groups and community associations to cheerleaders and mountain rescue. It gave the groups a really good opportunity to ask questions, pitch their ideas and get over some of their fears as well. Most of the groups were familiar with our Awards for All programme and people were keen to explore whether some of their ideas could be included in an application and find out more about our requirements. We got asked about leasing arrangements, bank accounts, organisation status, constitutions, what items we fund or don’t fund and getting quotations. On our Awards for All webpage we have a series of factsheets that answer a lot of the questions asked. Some groups had heard about our Empowering Young People programme and wanted to understand how we expect young people to be involved in coming up with ideas and with designing and delivering projects. These sessions gave us a chance to explain more about the aims of our funding programmes and what happens when we receive an application. I think it helped our customers to meet us directly, and to be more confident in dealing with us. We want people to tell us about their ideas in their own words and to be brief and to the point. Groups don’t need to pay consultants to write their application for them, and we aren’t looking for ‘key words’ or reams of data and technical sounding jargon.